Kanaashi Nogyo ace Kosei Yoshida pitches against Nichidai-san during the semifinals of the National High School Baseball Championship on Monday at Koshien Stadium. 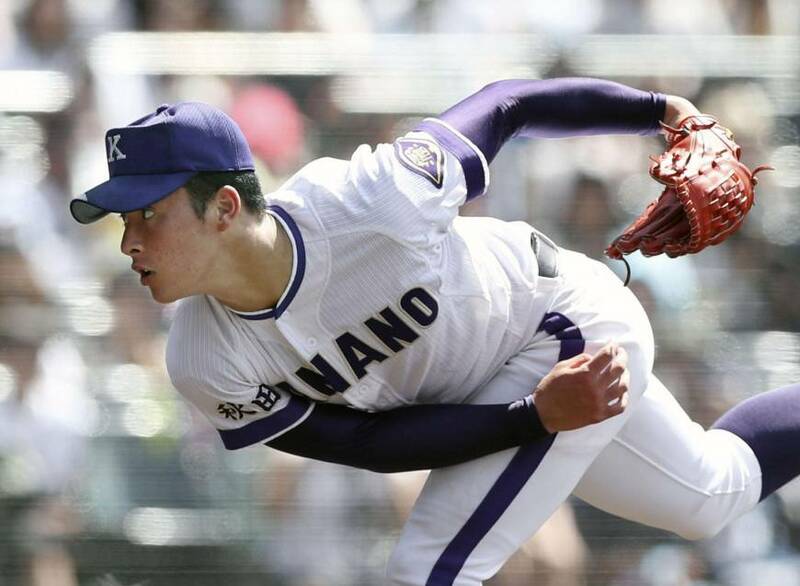 Aug 20, 2018 The Japan Times - Kosei Yoshida gave up nine hits and struck out seven over the distance, guiding Akita Prefecture’s Kanaashi Nogyo High School to a 2-1 victory over Tokyo’s Nichidai-san High School in the semifinals of the National High School Baseball Championship on Monday at Koshien Stadium. A team from Akita reached the final for the first time since 1915, when the very first tournament was held. In the final, Kanaashi Nogyo will face Osaka Prefecture’s Osaka Toin High School, which beat Saibi High School, from Ehime Prefecture, 5-2 in the day’s second semifinal. Kanaashi Nogyo third baseman Kazuki Uchikawa singled home a run in the top of the first inning and outfielder Asahi Otomo hit a run-scoring single in the fifth. Yoshida saw his double-digit strikeout streak end at four, but held Nichidai-san to one run over 134 pitches. He’s thrown 749 pitches over five games during the tourney. Osaka Toin advanced to the final for the first time since 2014 and is looking for its fifth summer tournament championship. Victory in Tuesday’s final would make Osaka Toin, which won this year’s spring tournament, the first school to win the spring and summer editions in the same year twice. Seven schools have completed the spring-summer sweep once. Ren Kakigi struck out 10 over the distance for the Kansai powerhouse. Former Yomiuri Giants and Pittsburgh Pirates pitcher Masumi Kuwata, who earned 20 wins and two high school championships (in the spring and summer tournaments) with PL Gakuen (Osaka Prefecture) from 1983-85, threw the ceremonial first pitch before first semifinal on Monday. Kuwata faced Kanaashi Nogyo in the semifinals of the 1984 tournament.